Hundreds of people are expected to don red outfits and white beards for the annual Santa Dash run on Sunday. 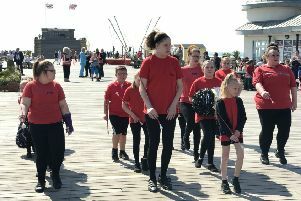 The family fun event will take place along Bexhill promenade, starting and finishing at the De La Warr Pavilion and will raise money for good causes. It is organised every year by Bexhill Lions, who aim to put the ‘Fun’ into ‘fundraising. Participants can run, jog, walk, push prams or use a wheelchair. Prizes will be awarded for best dressed dog, pram, pushchair or wheelchair/mobility scooter. There is a choice of a 2km or 5km course. It is open to everybody each participant is encourage to get sponsorship for their own personal charity or good cause to raise a minimum of £20.18 for the year 2018. The Santas will “dash” along the seafront towards Brookfields Road, returning to the DLWP terrace a distance of 2km. Those Santa’s keen to get fit, can go on to Galley Hill then turn back to West Parade toilets and return to the terrace. A distance of 5km. Richard Winrow, from Bexhill Lions, said: “Come along and be part of the heart-warming sea of red, having fun, raising funds and getting into the festive spirit. For more information on the Bexhill Lions visit www.bexhill-lions.org or call 0845 833 9591.